Are Vegetarian Chicken Eggs Healthier? Are vegetarian-fed chickens’ eggs healthier, or is this another marketing ploy by A&W? I haven’t eaten at A&W restaurants since their “Better Beef ” campaign and I was shocked to see their new campaign that started just a couple of weeks ago. They now have an “Egg Guarantee” that assures consumers their eggs are: “…farmed right here in Canada, from hens fed a fully vegetarian diet without animal by-products. It’s all part of our Egg Guarantee.” At least with the eggs are sourced 100% Canadian, unlike the beef which is sourced not only from within Canada, but also from the USA and all the way from Australia. Being the curious person I am, I wanted to learn more about why A&W is taking this marketing approach and what the differences are between laying hens fed a vegetarian diet vs. an omnivorous diet, since chickens are omnivores and will eat anything in nature. Both poultry and pigs are omnivorous and consumption of animal protein has featured prominently in the evolutionary history of their respective species, as Matt Oryschak, an animal feed researcher with Alberta Agriculture and Rural Development in Edmonton, told me. I did email A&W with a few questions but they ignored my email, so I also reached out to the Egg Farmers of Alberta (EFA) and they responded and also connected me with Matt. How Is Feed Produced for Commercial Poultry? Matt explained to me that the list of what can be legally fed to food producing animals in Canada is strictly regulated by Canadian Foods Inspection Agency (CFIA) to protect consumers and to ensure that the meat and eggs we as consumers buy at the grocery store are high quality and consistent. The short of it is that 95% of what you can buy at the grocery store to feed your family would be illegal for a farmer to feed to their livestock—even something as harmless as Cheerios. This is to protect consumers and to ensure that the meat and eggs consumers buy at the grocery store are high quality and consistent. Simply defined, they are “products of animal origin not intended for human consumption”. Matt says he prefers the term animal “co-products” vs. “by-product” as by-product implies waste. He also went on to tell me that approximately 1/3 – 1/2 of a meat-producing animal is unsuited for human consumption, so instead of just throwing that product away, renderers process and recyle these materials using different treatments to render animal fat used for multiple consumer products and animal protein meals. 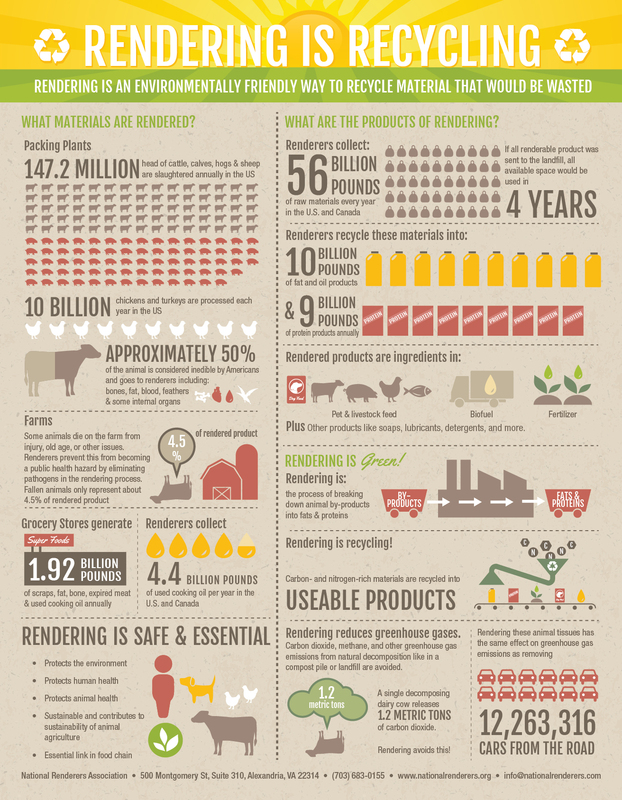 This is where animal by-products have a role to play in poultry feeding. Compared to vegetable protein sources commonly used in poultry feeding, animal protein sources have higher concentrations and a better balance of amino acids and contain highly digestible forms of calcium and other minerals. It’s all about balance when formulating diets for chickens, to make sure that a formula meets all of the chicken’s requirements at the lowest possible cost for the farmer. It certainly is possible to formulate diets that are free of animal by-products, but these diets typically result in lower efficiency (more feed needed to make more meat). Now I would like to share with you questions that I send to EFA and the responses from David Webb (DW) who is the marketing and communications manager of EFA and from Matt (MO). Me: What are the nutritional differences between eggs that are produced from hens fed vegetarian diets and those fed a mixture of grain & animal by-products, if any? DW: None. Hens may be fed different feed formulations (which always follow feed regulations set by CFIA), but all farmers work closely with their nutrition specialists to ensure that their birds receive a healthy, balanced diet. Not only is such a diet crucial for maintaining the hen’s health, but it also plays an important role in the quality of eggs produced. MO: From a nutrient standpoint – none. The chicken acts essentially like a ‘bioreactor’ and breaks the nutrients in the feed down to their building blocks and uses these to make eggs and meat. The only adverse effect on eggs that I am aware of is that too much fish meal in laying hen diets can impart a ‘fishy’ smell to the eggs in some instances. I’m not aware of any downside to feeding meat and bone meal. Me: What are the advantages of a vegetarian diet for a laying hen? MO: There are no real clear-cut advantages to a vegetarian diet, other than the ability to make a label claim that could bring a higher price. Q: What are the disadvantages of a vegetarian diet for a laying hen? DW: None. We support all of our farmers and promote the wide variety of eggs that are available on grocery shelves throughout Alberta and across Canada, including vegetarian eggs. Increased feed costs by $10/tonne. Swapping out a highly digestible, balanced and dense source of nutrients for ones that are less so will increase the costs of the ration because you would have to make up the difference with relatively expensive inorganic mineral supplements, vegetable oil (to boost energy levels) and crystalline amino acids (to meet amino acid requirements). Increased water intake to get rid of excess nitrogen from their system. Protein level in the diet increased to compensate for poorer amino acid digestibility in vegetable ingredients. Me: Is this a sustainable practice? Examples: do vegetarian laying hens require more feed? Do they produce less? Are there any statistics and research you can share with me? DW: Since the overall feed formulation is generally the same, with the protein source being the only differentiating factor, I think it’s fair to say that both options are sustainable. I should point out that most egg farmers in Alberta utilize their own on-farm feed mills, and they typically use the grains they grow as plant-based sources of protein. Farmers getting their feed from commercial feed mills are more likely to use meat meal as their source of protein, all of which is CFIA-certified. From an economic standpoint, animal co-products are another ‘tool’ in the commercial feed industry’s ‘toolbox’ to help control feed costs for producers, which in the poultry industry accounts for about 70% of total production costs. Controlling costs allows the supply chain to deliver a high quality product to the consumer at a price that they can afford. From a socio-environmental standpoint, if sent to landfill, animal co-products would result in millions of tonnes of excess greenhouse gases on top of the pest issues that would ensue. The recycling of animal co-products into both feed and bio-industrial applications allows nearly 100% use of the biomass generated by animal agriculture. This is analogous to grazing animals on hilly terrain unsuitable for crop production – food is produced from acreage that could not otherwise support human food production. From an environmental standpoint, one of the principle concerns relates to ammonia emissions, which are the direct result of over consumption of unbalanced protein; vegetarian diets typically contain higher levels of digestible protein. As a result, chickens consuming vegetarian diets would be expected to generate more ammonia per animal unit. Perhaps the only knock against the sustainability of the use of animal co-products relates specifically to the use of fish meal. Wild stocks of anchovy and menhaden have been measurable depleted through overfishing in order to supply the demand for fishmeal and oil largely from commercial aquaculture. For these reasons, I would make the argument that the continued use of animal co-products for livestock and poultry feeds contributes positively to the sustainability of animal agriculture in Canada and around the world. There is no nutritional difference between vegetarian eggs vs. non-vegetarian eggs and it is legal, safe, and nutritious for hens to be fed animal by-products, according to the EFA. They also state that now, more than ever before, there are many kinds of eggs to choose from at your grocery stores and markets and they are all produced to the same high standards of cleanliness, quality and freshness. No matter what you choose they are safe, nutritious and delicious. Through the process of rendering, animal by-products are used in many ways that benefit all of us from making healthy and nutritious feed for animals, to making commercial items like lipstick and tires, otherwise it would be taking up space in landfills and creating lots of other problems for our environment. A big thank you to the Egg Farmers of Alberta and Matt for lending me your expertise to help me write this article. Sorry this article was so long, I blame it on Matt’s enthusiasm and passion for his career, which I admire greatly! Scrapie and Mad Cow disease came about because of feeding animal byproducts. Chickens are indeed not vegetarians but feeding animal byproducts may create other issues? Chickens do eat grubs and worms and bugs so why not feed that rather than animal byproducts? The BSE issues came long before my time of blogging about agriculture, so I don't have an informed opinion on said issue, but I do trust the CFIA and the research that is being done. We have the safest food system in the entire world, but like anything in life—nothing is 100% perfect or 100% safe. There are food recalls all the time, but our system catches it too. Thanks for the comment! I figure I would never take it out on some kid at a cash register who has no control over these things, but you bring up a good point! I have written A&W emails (at their encouragement on their website) and they have failed to answer me. They tweeted me back and said "we don't claim our eggs are healthier" but also didn't deny that this is a marketing ploy (which it certainly is). I detest fear based marketing and have boycotted A&W since they began such. Me too. I miss the root beer, but I prefer to spend my fast food dollars with a company that's dedicated to transparency and sustainability like McDonalds. Great questions and explanations, Sarah! I'll be sharing this, as there is so much confusion about eggs, egg terms and egg marketing campaigns in the U.S. as well. That means a lot coming from you, Lara—thank you! Essentially an egg is an egg is an egg nutritionally (except when they are fed extra Omega-3s from my understanding) it's just the price that varies per how those eggs were produced. Gotta love all those labels!